Product information "Roll Through Scales DSI SST"
The stainless steel scales Bosche DSI SST series are ideal for weighing in the food and pharmaceutical industries. The small ramp allows easy driving on the scale. As standard, the balance is delivered space with a ramp. Here, optionally, at the other end of the scale, a cross-over backup to be installed which prevents overshooting of the scale. A second optional ramp allows a complete driving through the material to be weighed. Especially for weight determination of small mobile containers this platform scale is ideal. The raised sides of the weighbridge prevent slipping of the sample. Use the numeric keypad, a tare weight (known weight of roll containers) can be entered so that the balance indicates only the actual weight. The combination of the weighing platform with the balance display MWI is intended for advanced weighing applications in verifiable and non-verifiable area. Weighing platform with ramp 1: particularly space-saving, suitable for weighing applications where the object should only be moved up and down. To prevent a drive through, can be ordered optionally a drive- limiting. 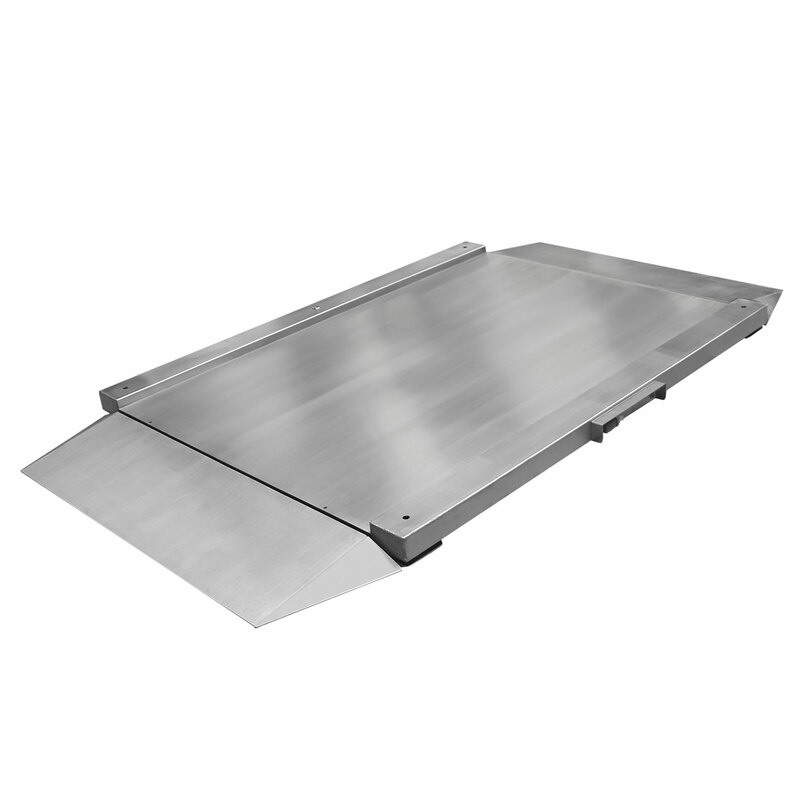 Weighing platform with 2 ramps: suitable for weighing applications, where a passage through is necessary. The platforms are equipped with four high-quality load cells. The display device MWI with large 50 mm display is responsible for the clear weight determination and summing the weighing results. The tare is executed over the entire measurement range. The platform scale is supplied as standard for network operation (power cord included). The optional rechargeable battery allows a self-powered weighing. The RS 232 interface allows a bidirectional data transfer of weight data to a PC, printer or remote display. Transmission cable, external auxiliary display (suitable for sale to the public) or printers are available as accessories. Related links to "Roll Through Scales DSI SST"
MWI - the weight display is housed in a rugged plastic housing with protection class IP 54. MWI-A - the weight display is housed in a rugged aluminum housing with protection class IP 65.